Dramatic declines in the price of oil are finally causing changes that should begin to tighten supply and reverse the downward trajectory of oil prices. While the oil crash has continued largely unabated since June, U.S. rig counts are now falling sharply. Here’s why this matters to you. Every week oil services giant Baker Hughes (NYSE: BHI) publishes the latest count of rigs operating in the U.S. If you care about the changing oil market and oil charts, you should absolutely be watching this metric closely. Why? The answer is the age-old economics cliché: Supply and demand. Basic supply and demand – on a very large scale – has everything to do with why oil prices have fallen so dramatically. 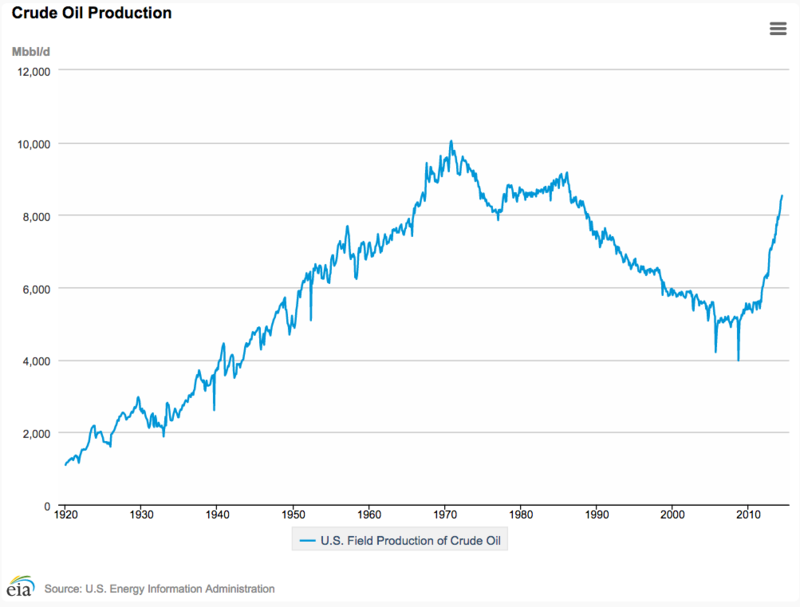 The oil chart below shows the massive explosion in production capacity experienced during the last few years of the U.S. energy boom. Naturally, the rapid growth in production capacity over the last few years translated to huge growth in the supply of oil. And, as in any situation where supply rises faster than demand, this is one of the primary reasons we have seen the price of oil fall so hard. The chart below shows the performance in the United States Brent Oil Fund (NYSE: BNO) since the last week of June. What the chart shows is the oil crash everyone is talking about, with oil prices falling nearly 60% in the last seven months. When the price of oil falls, what kinds of things do we expect to happen? As oil falls further and further and approaches or passes the break-even prices of U.S. shale operations, oil production companies will first stop developing new projects and oil exploration activities. Then they will cut back on existing rigs, reducing the amount they spend on personnel and operations but also reducing the amount of oil they can produce. Eventually this falling supply catches up to the demand for oil and prices begin to turn around. So far all of the steps described above have taken place except for a turnaround in the price of oil. This makes me think the market is still in “cut back” mode and there is more to come in terms of oil services companies cutting back on expenses and shutting down rigs. 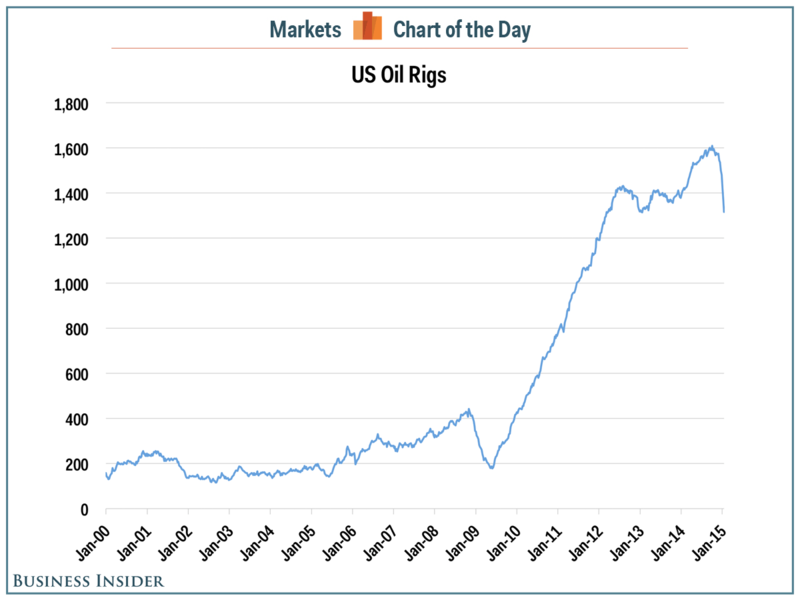 The chart below shows the number of active rigs in the U.S., as measured by Baker Hughes. The number of active rigs is now down to 1,317. This represents a decline of roughly 18% from a high of 1,609 active rigs recorded in October. As the number of oil rigs in operation falls, oil production decreases and oil supply decreases along with it. As long as demand doesn’t fall as dramatically, this is the long-term change necessary to reverse the downward trajectory of oil prices – eventually. Baker Hughes itself announced that it would cut 7,000 employees. Australian mining giant BHP Billiton (NYSE: BHP) said recently that it would shut down 40% of its U.S. shale rigs by the end of its fiscal year. Oil services company Schlumberger (NYSE: SLB) recently announced its own plans for job reductions of roughly 9,000 positions. Halliburton (NYSE: HAL) said that it intends to cut back on jobs and expenses in line with its competitors. The big question is how much further will oil fall and rig counts decline before the price trend of the oil crash reverses? Baker Hughes notes that in a major downtrend for oil, the number of active rigs typically falls between 40% and 60%. If this is true, there is still a significant amount of pain ahead for the oil services companies. On the low end of these expectations, we’re halfway there. On the high end of these expectations, we’re only one-third through the rig shutdowns and cutbacks. Keep watching the number of active rigs. The price of oil can rise and fall due to market noise. But if the price of oil reverses its decline AND the number of active rigs rises along with it, you’ll know that the reversal is real and the oil crash is over. The U.S. has been forced to deal with backward, oppressive regimes, like Saudi Arabia, for decades — simply because geography had blessed them with massive reserves of the life-blood of modern society — oil. Well, that dominance is now over. Because the United States is set to become THE leading energy producer in the world. This is the day the Saudi’s — and every other OPEC nation — prayed would never come. And we’ve found a great way for the average guy to cash in. Click here for all the details.